Larissa Owens is happy with her life. She loves her job as personal assistant to Jack McGarry, former star quarterback of the L.A. Stallions and current partner in Score, a PR company recently relocated to Fool’s Gold. She’s also private masseuse to Jack and his partners—Sam Ridge, Kenny Scott, and Taryn Crawford. Larissa had reservations about the move to Fool’s Gold, but she has quickly fallen in love with the warm, quirky town and the new friends she has made there. Magical Mayor Marsha even persuades her to adopt a Ragdoll cat, the beautiful and discriminating Dyna. All this and the freedom to satisfy her need to save the world—or at least a portion of it—with Jack’s checkbook makes life almost perfect. Larissa doesn’t think about the “almost” until her mother comes for a visit and changes everything. For reasons he doesn’t allow himself to think about often, Jack McGarry lives life mostly on the surface. He prides himself on his tight control over his emotions. Charming, generous, and quick with a quip, he has a magnetic appeal, but he allows only a rare few into his inner world. He counts on those friendships. Sam, Kenny, Taryn, and Larissa are his family. He refuses to allow himself to need anyone else. His romantic escapades are strictly for the moment, with none of them lasting long enough to even deserve the term “relationship.” Known for his charitable works, he thinks of himself as supplying the funds while Larissa supplies the heart. Everything changes when Larissa’s mother pays a visit to Jack’s office and asks him to fire Larissa. Nancy Owens wants her daughter back in Los Angeles where she can meet a nice guy, get married, and give Nancy more grandchildren. Most of all, she wants her away from Jack McGarry because Nancy believes Larissa is in love with Jack and headed for heartbreak. When Jack questions Larissa about her mother’s claim, Larissa insists that her mother is wrong. But once the words have been said, neither Jack nor Larissa can forget them. They are aware of each other in a different way, and a couple of heated kisses complicate the situation even more. Soon they are intimately involved with the understanding that the relationship comes with an expiration date, but old problems remain unresolved. When Jack detonates the explosion that destroys his world, the damage is heavy, but no one is more wounded by his viciousness than Jack himself. A fairy tale ending never looked more impossible. 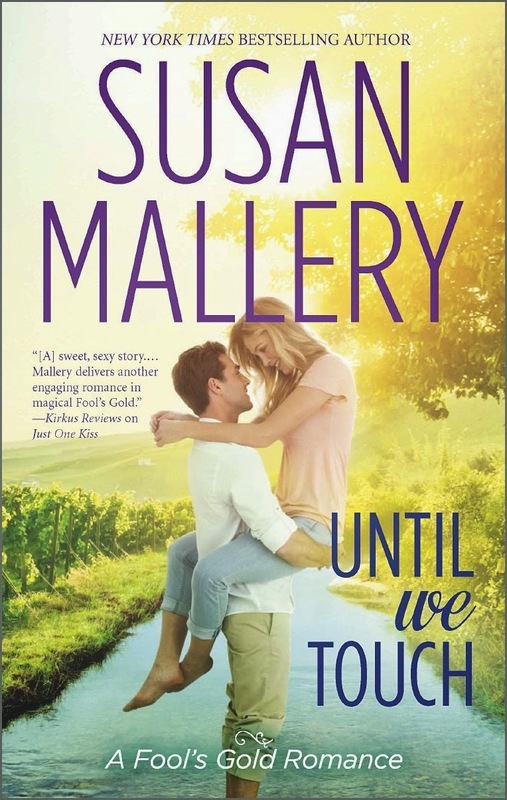 Until We Touch is #15 in Mallery’s Fool’s Gold series, and the commitment-phobic hero (along with a few heroines who have their own problems with commitment) is standard fare in the series. But Jack may be the most complex and interesting in that long list. He does turn into a super jerk, as quite a number of Mallery’s heroes do, but his jerkdom has a self-destructive edge that sets him apart. There is also the matter of Larissa and Jack’s mutual enablement. Larissa has some baggage of her own, and it compels her into the savior role. Saving the world a bit at a time, whether it is a transplant patient, an owl, or butterflies, allows Larissa to avoid looking at her own life which is singularly lacking in long-term commitments. She has never even had a pet until Mayor Marsha maneuvers her into adopting Dyna. Jack’s money gives her the means to do good at little personal risk. However, Larissa gains self-awareness and works at tackling her problems well before Jack reaches that point—and she does so without inflicting harm on others. Jack has spent his adult life keeping a vow he made at seventeen. If he keeps the world at a distance and invests nothing of himself, he can’t be devastated by loss. When he discovers that bit by bit his life has become entangled with others in ways that demand more than he ever wanted to risk, he panics—and he strikes out in ways that inflict deep wounds. It takes Jack to almost the end of the book to realize his actions have left him with a life barren of everything and everyone who gave it meaning. I’m not sure I agree with the adage to understand all is to forgive all. I understand Jack’s behavior, but he is forgiven real meanness much too quickly for my liking. The resolution not only to the conflict between Jack and Larissa but also between Jack and Taryn and Jack and young Percy was much too quick for me to fully trust it. There is much I loved in this book: the recurring Fool’s Gold characters, Taryn preparing for her wedding, a homeless teenager who totally won my heart, and Dyna who made me forget I am not a cat person. But even all these things are not sufficient to make me forget that I was emotionally invested in these characters and I felt cheated by the abrupt conclusion. Nevertheless, I remain a dedicated Fool’s Gold fan. Susan Mallery’s gift for characterization is superb, and I love the town she has created with its distinctive history and growing cast of characters whose happiness matters to me. I started the series with the first book, and five years and fourteen stories later, I still eagerly anticipate the next one. In fact, I expect the novella “Yours for Christmas,” the story of big, gentle Kenny Scott and war widow and single mother Bailey Voss to be a favorite. Final word on Larissa and Jack’s story: it is an emotionally engaging tale with characters who etch themselves into the reader’s memory, but the hero’s off-the-charts jerkdom and the too rapid conclusion left me disappointed, although not sorry I read the book. I do enjoy the Fool's Gold series. I usually agree with your reviews. I am still going to read UNTIL WE TOUCH. I will be interested in how I relate to Jack and Larissa and their relationship. I'm not usually a contemporary reader but I make exceptions and I have some of her books on my tbr pile just waiting for me. I love this series! I have to catch up until I reach this particular trilogy but I'm so looking forward to Larissa and Jack's story. Susan Mallery writes such enjoyable books! Thanks for the great review! I just finished my first Susan Mallery and Fool's Gold book, BEFORE WE KISS. She does do a very good job of building her town and the characters. I enjoyed it and am looking forward to Larissa and Jack's story. I am interested in seeing if my reaction is the same as yours. Serious meanness is a character flaw that is hard to overlook or like in the hero of a story. It is selfish and points to other possible problems. Redemption isn't quick or easy. It takes major introspection and work to overcome. Whitewashing it or solving it too easily isn't realistic or ring true.